Chopard brings us yet another enlightening press release explaining the art of gem setting, part of a series of write-ups exploring different crafts at Chopard. 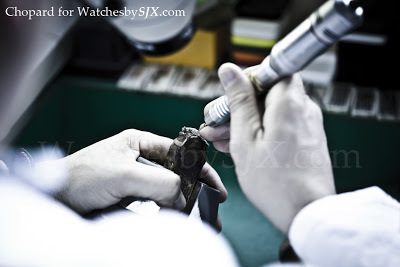 Being as much a watchmaker as jeweller, Chopard has some unusual expertise, including gold casting. Earlier articles covered electroplating as well as hairspring assembly. 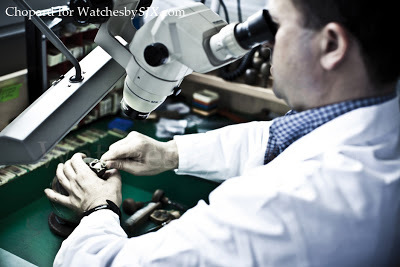 While the parts imagined by the designers take on shape and volume beneath the expert fingers of the jeweller, they spring to life in the gem-setters’ hands. It is these artisans who clothe the jewellery in colours and light by skilfully inserting the gems in their metal mounts. 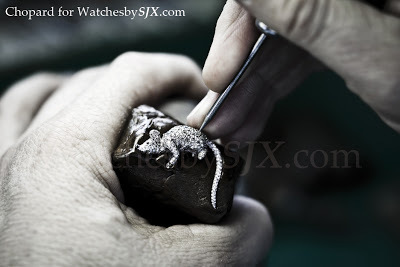 At Chopard, the gem-setters’ sole aim is to sublimate the Haute Joaillerie or watchmaking creations entrusted to them. In pursuing this goal on each new precious object, they constantly push the limits of their craft, inventing new types of setting, and driving the gems into parts of the jewellery that are particularly thin, small or hard to reach. 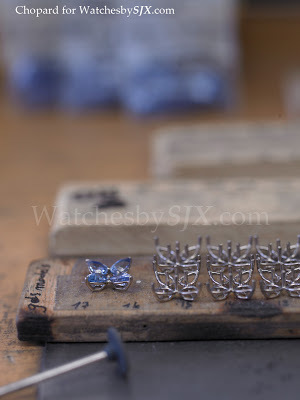 The piece to be “clothed” arrives in its rough state in the gem-setting department, directly on the jewellers’ workbench. 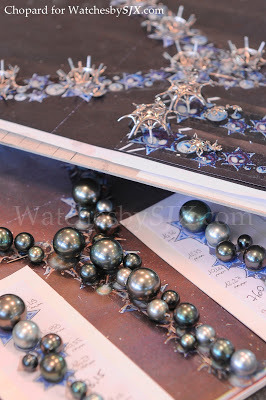 According to the original sketch and the volume of the jewellery now in hand, they determine the diameter of the gems to be used, as well as the most appropriate setting technique. They also choose the type of gems to be used, often in cooperation with Caroline Gruosi-Scheufele, Head of the Creation and Jewellery department. This choice requires a perfect knowledge of stones, of their delicate nuances, of their lustre as well as their degree of fragility. 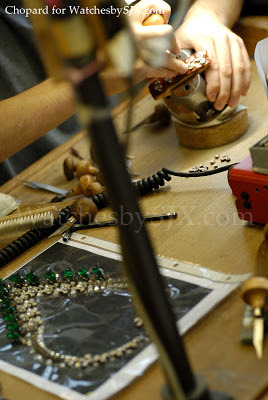 After placing the corresponding order with the gemstone selector, and armed with a cutter, the gem-setter begins the task of mitraillage, meaning drilling the material to arrange the various holes that will later house the stones. 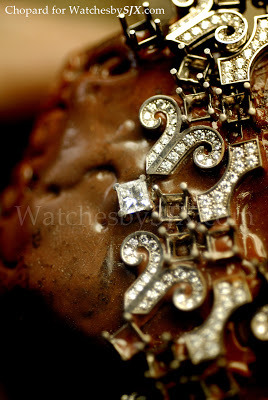 During this particularly perilous stage, and in order to avoid any distortion, the jewellery is held in place on a support with a brick and tar paste called chasers’ or engravers’ cement. Within the High Jewellery department, most of the creations to be gem-set are unique and composed of extremely small parts that are very delicate to work with. Much like an impressionist painter, the gem-setter works shade by shade, diameter by diameter. Each stone has its own bed. “To make things easier, I make a little sketch on paper showing the chromatic arrangement of the gems. Another sketch shows me where to place such or such a size of stone”, explains Carlos, a gem-setter for over 20 years. “Each felt-pen colour corresponds to a different diameter”. 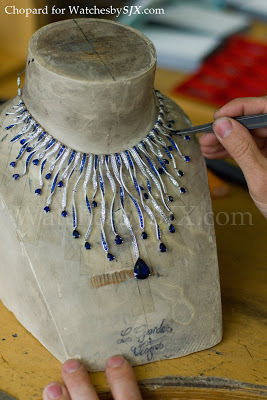 Carlos is working on a peacock bracelet that involved placing 7,500 stones! He has reached the final phase and is creating feathers for the bird. Each of them requires around five hours of effort. A microscope is indispensable in this painstaking task. “This piece of jewellery takes a particularly long time to set because I am using stones that are really tiny (0.6 mm in diameter) and also extremely fragile, such as paraibas, emeralds and tsavorites”, explains Carlos. 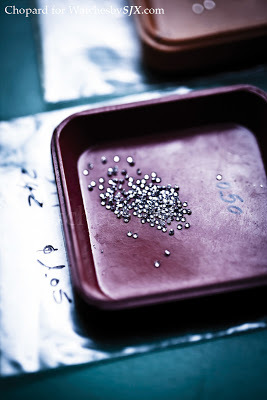 “Setting diamonds, which are far harder stones, takes a lot less time”. There are various types of gem-setting: closed, grain, pavé, claw… The structure of the piece of jewellery, as well as the quality and the size of the stones, determine the choice of gem-setting model. 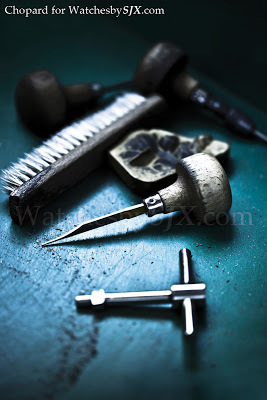 The artisan’s role is to ensure the brilliance of the stone, to highlight it to the extreme, and to almost entirely conceal the underlying metal. Carlos goes on to say that he has “invented a new type of gem-setting I call ‘scale’ setting. This involves drawing out and enlarging the stone without rendering it more vulnerable”. Displaying infinite dexterity and patience, the gem-setter hollows the matter, honing, modelling, pushing back, bending and cutting where necessary with a scorper or graver. They insert the gems with tweezers and then, armed with a graining tool or beader, which has first been hollow-cut and polished in order to ensure a glowing shine of every last thousandth millimetre of the gold, they fashion and round the grains that hold the gemstones. Their every move is steady and accurate and the strength applied is carefully controlled, since even the slightest slip might risk damaging the stone or the metal. Nonetheless, gem-setters do not work in complete silence: whereas Arturo listens to audio books on a personal stereo, Carlos likes to have the radio on as background noise. Each has his own method of achieving optimal concentration!